May 21, 2013, 10 a.m.
By Nikki Usher @nikkiusher May 21, 2013, 10 a.m. In Miami, Twitter takes on two distinct modes during the day — in the morning as headline service and in the afternoon as conversation. “In the morning, we try to get the audience between 6 and 8 a.m. on Twitter and on the website,” says continuous news editor/day editor Jeff Kleinman, who says he wakes up at 4:30 to begin monitoring the news. Kleinman uses Twitter to break news — whether or not it’s on the paper’s website. “We want to be first,” he noted, as he quickly dashed off a tweet about a boat fire in front of me. More often then not, though, there will be a link to a short two-paragraph story begun on the website. But not always. There’s less time for conversation, but Kleinman is especially careful to do one thing: retweet what his reporters are offering from the field to the wider audience. “We’re not there, but they are, and Twitter is often the fastest way to say what’s going on,” he noted. So while the reporters have their own followings, their work gets amplified to a larger audience. Walter Michot, a former photographer who prowls the city with an iPhone (another story), has frequently broken news on his Twitter account, which has then been retweeted by @miamiherald. The mantra in the newsroom is to tweet, write, tweet, write, perhaps blog, and then write a takeout for the web and perhaps the paper. Later on in the afternoon, Twitter and Facebook take on a more conversational tone. Luisa Yanez runs the @miamiherald account then. She focuses on three key things: curating incoming reporters’ work and retweeting it — adding additional substance if necessary; offering updates from the website; and responding to readers. The Miami Herald also offers updates about traffic and weather “as a public service and because people want to know,” Kleinman said, so followers might see something like this. #Weather alert: Severe thunderstorm warning issued for the #Keys until 1:30 p.m.
And then Yanez will retweet a reader who happens to chime in with a photo, in this case, Marven The Martian (@DaReelMJ), who offers a twitpic of the nasty weather brewing. The Herald is writing about ruling that would allow teens to obtain the “morning after” pill. Please contact aburch@MiamiHerald.com. @jackieblue4u Closer to gator, and smoking it really did make it taste like bacon, or prosciutto. Kleinman and others acknowledge that the tweet-to-web traffic conversion isn’t what they’d like it to be. But for them, Twitter is a way to build an audience, establish their continued brand prominence, and carry on a conversation. And while The Miami Herald newsroom might be losing the best view in journalism for a new home by the airport, location might not matter as much as it once did, because their conversation with their audience is virtual. Those who doubt that a newsroom that is struggling with staff and budget problems can handle putting the time and energy into social media should look at Miami and see a case of what’s going well. And those who think that community conversation is too hard to handle should also pause and consider the possibilities that do exist when a newsroom engages with its community. Especially if it’s about eating python. 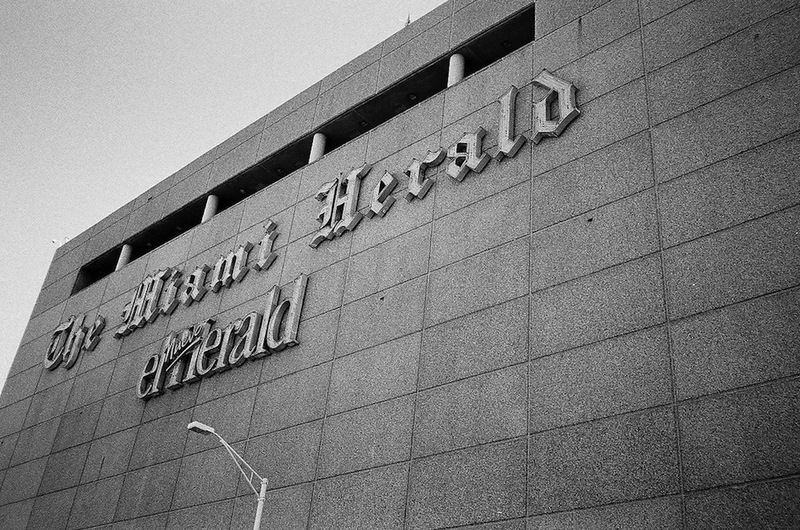 Photo of outgoing Miami Herald building by Phillip Pessar used under a Creative Commons license. POSTED May 21, 2013, 10 a.m. Usher, Nikki. "At The Miami Herald, tweeting’s about breaking news in the a.m. and conversation in the p.m.." Nieman Journalism Lab. Nieman Foundation for Journalism at Harvard, 21 May. 2013. Web. 18 Apr. 2019. Usher, Nikki. "At The Miami Herald, tweeting’s about breaking news in the a.m. and conversation in the p.m.." Nieman Journalism Lab. Last modified May 21, 2013. Accessed April 18, 2019. https://www.niemanlab.org/2013/05/at-the-miami-herald-tweetings-about-breaking-news-in-the-a-m-and-conversation-in-the-p-m/. | title = At The Miami Herald, tweeting’s about breaking news in the a.m. and conversation in the p.m.